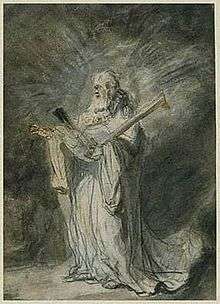 Heavenly host (Hebrew: צבאות‎‎ sabaoth, "armies") refers to the army (Luke 2:13) of angels mentioned both in the Hebrew and Christian Bibles, as well as other Jewish and Christian texts. Several descriptions of angels in the Bible describe them in military terms, such as encampment (Genesis 32:1-2), command structure (Psalms 91:11-12; Matt.13:41; Rev.7:2), and combat (Jdg.5:20; Job 19:12; Rev.12:7). The heavenly host participate in the War in Heaven and, according to some interpretations, will battle Satan and Satan's own army at the End of Days and be victorious. 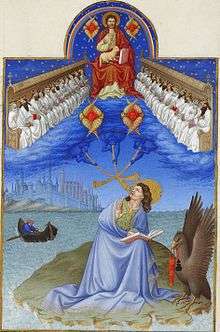 Visions of John the Evangelist, as depicted in the Très Riches Heures du Duc de Berry. Four cherubim surround the throne and twenty-four elders sit to the left and right. Cherubim are depicted as accompanying God's chariot-throne (Ps.80:1). Exodus 25:18-22 refers to statues of two cherubim placed on top of the Ark of the Covenant. J. A. Motyer writes: 'the cherbim overshadowing the ark were a pedestal for the invisible throne of the invisible God'. Other guard-like duties include being posted in locations such as the gates of Eden (Gen.3:24). Cherubim were mythological winged bulls or other beasts that were part of ancient Near Eastern traditions. This designation might be given to angels of various ranks. An example would be Raphael who is ranked variously as a Seraph, Cherub, and Archangel. This is usually a result of conflicting schemes of hierarchies of angels. In Revelation 5:11 a figure of ten thousand times ten thousand (100 million) is given for the number of "many angels in a circle around the throne, as well as the living creatures and the elders". 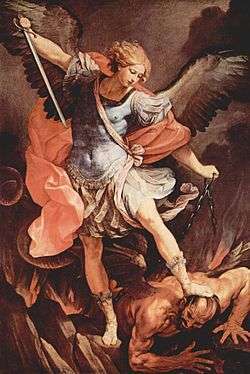 In the English epic poem Paradise Lost by John Milton, the Archangel Michael commands the army of angels loyal to God against the rebel forces of Satan. Armed with a sword from God's armory, he bests Satan in personal combat, wounding his side. ↑ Davidson, Gustav (1994) . A Dictionary of Fallen Angels, Including the Fallen Angels. New York, NY: Macmillan, Inc. ISBN 978-0-02-907052-9.